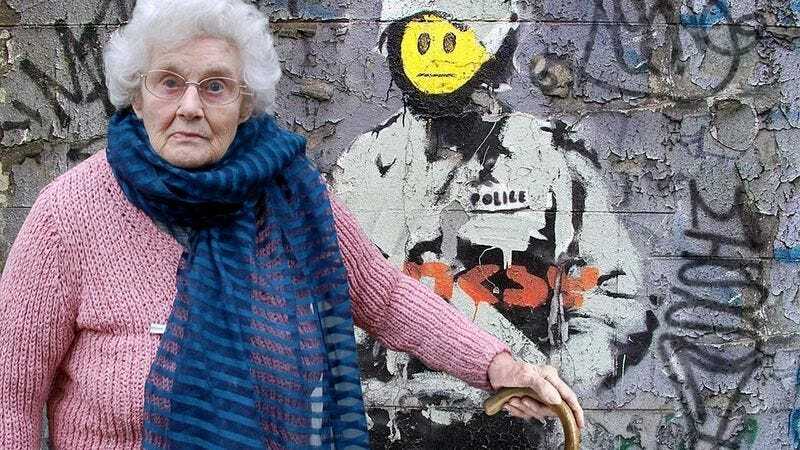 LONDON—At a press conference Tuesday, 89-year-old Rose Biggin, a grandmother from the Camden Town neighborhood of North London, announced that she was in fact the internationally renowned graffiti artist known only as Banksy. "Those drawings? Oh, yes, those are mine," said the diminutive octogenarian, who admitted to scaling buildings and climbing fences in order to put up life-sized stenciled images that satirize modern society's mores and its inherent political power structures. "It sure does help to pass the time." Biggin then returned home, where along with some of her "dearest friends," she sipped tea, sampled some nice ginger cake, and planned the necessary destruction of dominant capitalist paradigms.